With all the free music sites out there, how do you decide which one to use? A huge library of songs is one criterion, but maybe design and ease of use are more important to you. 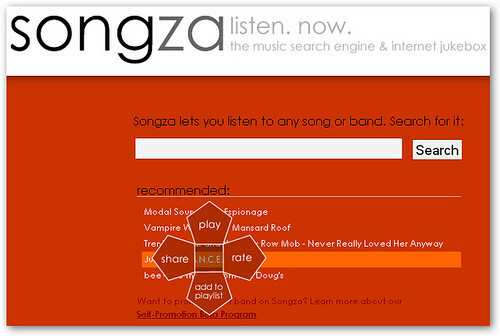 Songza is designed with that kind of user in mind, keeping the user interface clean and incredibly fast. After a quick search, you can use the simple remote control to listen to music directly in your browser and also rate, share, and add songs to a playlist. That's it. There's no need to register, and you can play the exact song by the exact artist that you're looking for instead of listening to "similar" songs as determined by a website's music algorithms.